I would recommend Damon to anyone who is going through a divorce and/or child custody. He is professional and courteous. His knowledge of these issues is comforting when going through a difficult process. Damon is very easy to talk to, and readily available to answer any questions or concerns with a divorce and/or child custody. If he is not available when you call, he returns your phone calls and/or e-mails. Appointments are easily scheduled through his office. He is a wonderful attorney. He makes you feel your matters are a priority, and does his best to resolve legal matters in a timely and courteous manner. I retained atty. Hopkins to represent me during my divorce proceedings due to the fact that I saw he was not only an attorney, but a Counselor as well. I thought that would be valuable since divorce can certainly be a difficult and emotional experience—it was for me. Fortunately, it was a good decision to retain him. Atty. Hopkins is knowledgeable (he truly could be a Judge) and extremely professional. He calmly and thoroughly explained the process and my options. He was receptive to my issues and sensitive to the fact that a child with a disability was involved. At the end, he presented me with realistic choices and expectations. He was strong and clear with the opposite attorney and in fact took the lead role in preparing most of the documentation necessary. Bottom-line, Atty. Hopkins possesses a great combination: knowledge, sensitivity, and toughness. Highly recommended. Mr. Hopkins is truly a master of his craft. He assisted me in a family court case and I could not have been happier with his attention to detail, explanations, and RESPONSIVENESS. 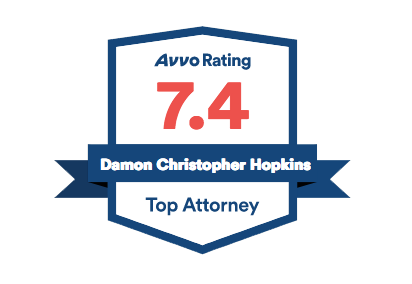 I have dealt with other attorney’s, and Mr. Hopkins is by far the best at getting back to me in a timely manner. I would highly recommend him to anyone looking for a no BS attorney, who always keeps your best interests in mind. Attorney Hopkins is very professional and prompt and handling cases. The staff in his office are very welcoming and very professional. I would highly recommend attorney Hopkins to all who need help. He is always in contact with his clients and keeps clients up-to-date and gives great advice. He is one of few attorneys that is in this business to help people and not just to take your money. He whole heartedly cares for his clients and the outcome of their cases. Damon helped me through the most difficult time in my life. Not only did he have the legal knowledge, his kindness and understanding will never be forgotten. I would highly recommend Damon Hopkins and in fact just did to a co-worker. Thank you Damon. Atty. Hopkins has represented my family since 2009. His advice has always been excellent and on point. He has been supportive, respectful and responsive. I wouldn't hesitate to recommend anyone to his practice. As a school teacher and member of PSEA, Attorney Hopkins was on the list of recommended divorce attorneys. I couldn't have made a better choice. He was able to guide me through the labyrinth of the divorce process and all of its paperwork. He listened to my concerns and frustrations with how my wife's attorney was trying to control the settlement. Atty. Hopkins was tough when it was necessary but still compassionate enough to see that I wanted to be fair with the final settlement. A smart choice for me. Damon is a spot on attorney that calls as he sees it. He is well organized, planned for results, disciplined and trustworthy. Delivery outstanding and brutally honest, he is up for all challenges and developes a positive repore with all. Damon is an honest, compassionate, exceptional attorney and follows through on what he says. Mr. Hopkins and his team were wonderful, supportive and very dedicated people. He is exactly the type of lawyer you want on your side and you never want to go up against. I would strongly recommend to anyone going through a divorce. I had a free consultation with this firm. All I can say is they are incredible, professional, nice, kind, and extremely helpful. It was way beyond my expectation for a free consultation. They are very ethical. Damon Law Office handled my divorce. If you are looking for a man that is experienced within his field and passionate about his job then I certainly encourage you not to look any further your help has just arrived. He is a solid lawyer who practices nothing but the best customer service and approachable, extremely professional and pushing relentlessly for the success of our filing. He has always taking the time to make sure I understand the law and the situation without ever talking down to me or making me feel uneducated. Damon gets every detail, he prepares like nothing I have ever seen, he explained to me how we would present the case and helped me through the legal process what make my life much easier. Also, he is a gentleman and a real lawyer who wants to win your case. Very knowledgeable with the law. Very friendly and always gets back to me quickly when I call. They really give 100%! I would highly recommend this law firm! My son, who was a juvenile at the time, had an altercation with a neighbor who was almost three times his age. My son was charged with three different things because the neighbor did not tell the whole truth. Of course, the detective at the time, heard one side of the story from this neighbor and wouldn't even listen to me or my son's father. We even went down to the police station the next day to talk to this detective again and he bascially "blew us off." Needless to say, it was time to find a good lawyer because this neighbor has been a nuisance to others in the neighborhood too. This was the last straw for us!! I looked in the phone book and saw Atty. Damon Hopkins advertisement in the yellow pages. His ad said something in order of if you have a loved one who is in trouble with the law and unjustly accused...this was the lawyer I wanted for my son. I felt like, at the time, reading his advertisement was a sign from God to pick this attoney. My gut instinct was right on. Atty. Hopkins is brilliant! He treated my son like his own. He was respectful to me and my family. Luckily, we have never needed another lawyer since that time, but I would use him again, if needed. He was able to prove that the neighbor had lied about a couple of things and the two worse charges were dropped. My son received a misdomeanor of "disorderly conduct." A small fine was paid and the case was closed. This attorney was our hero!! I would recommend Atty. Damon Hopkins to anybody. Damon was my attorney for my divorce. He made my experience as easy as possible and was great at getting back to me in a timely manner and staying on top of everything that was going on. He did an excellent job at getting me what I needed and helping me to understand all the legel jargon that was involved in the process. I felt that I could trust Damon at all times to keep my best interests in mind. I couldn't have asked for a better attorney. Divorce is a difficult process to go through, but Damon made the process go as smoothly as possible. I feel that he took excellent care of me at a very difficult time. I would not hesitate to recommend Damon to anyone!! He is very knowledgable and on top of everything, he is genuine and trustworthy. Excellent, Professional and has client's best interest in mind. I would use his services again if needed.